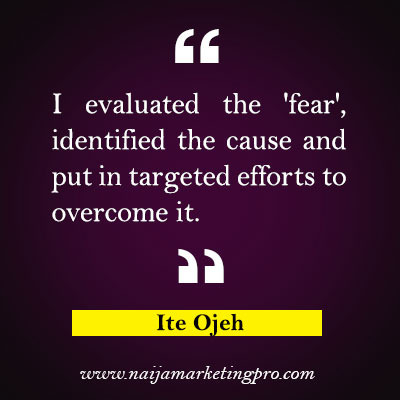 Home » Interviews » HOW TO OVERCOME FEAR IN MY BUSINESS, LIFE AND EVERYTHING with ITE OJEH. 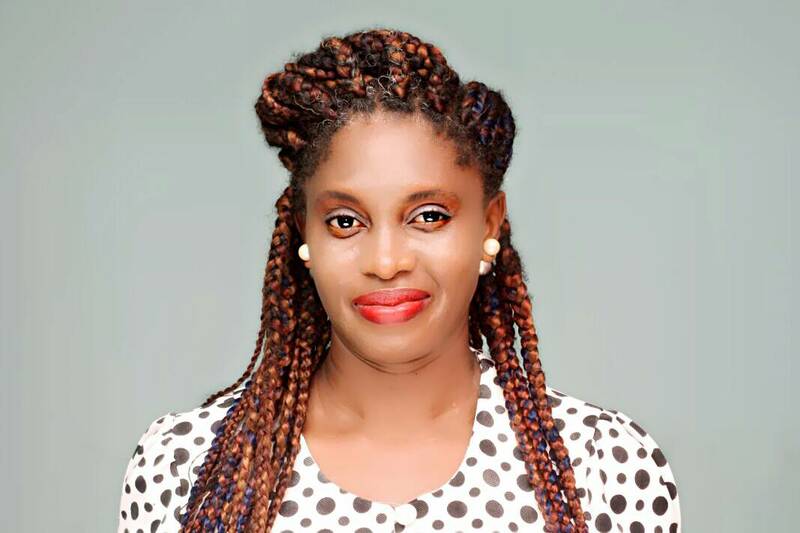 Ite Ojeh is a Mompreneur, an MLM Blogger and a Home Based Business coach at www.iteojeh.com. Prior to that, academic pursuits took her through the Biological and Environmental Sciences at different levels. During and after formal education, she had the opportunity of working with Professionals in the Corporate world through various local and international associations and organisations. This gave birth to the passion she’s pursuing today. It is her desire to educate and empower many people to become financially free and independent. Ayodeji Oladeji Charles: But before we continue. Let me quickly bring it to your notice that our social media team are here. Ite Ojeh: It’s fine by me. Ayodeji Oladeji Charles: I will also like to appreciate you for your readiness and willingness to help others succeed. Ite Ojeh: My pleasure. Thank you too for the opportunity. Ayodeji Oladeji Charles: This interview is projected basically to help give our people most especially youths and success seekers confidence whenever it seems fear sets in their journey of life and business generally. Ite Ojeh: My name is Ite Ojeh. I’m a Mompreneur, an MLM Blogger and Home-Based Business Coach. Ayodeji Oladeji Charles: Thank you Ojeh. Let’s talk about fear for a second, because I truly believe in my experience that the number one thing that holds people back from achieving what they want to achieve in their business and in their life is a fear of whatever. Someone says, ‘Fear! The one compelling thing that stands between you and your dreams.’ Is that correct? If yes, how? Ite Ojeh: To a very great extent I’d say yes. Fear makes one limited. It prevents one from realising his/her full potentials. Ayodeji Oladeji Charles: OK. Please shed more light. 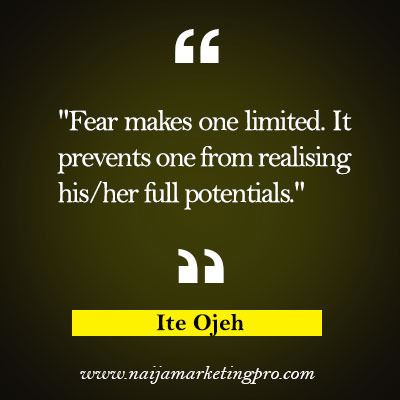 Ite Ojeh: Fear prevents one from getting out of their comfort zone. Everyone has inner talents/potentials/abilities that are untapped. Fear makes up all the reasons why one CANNOT do the needful to attain success. Ayodeji Oladeji Charles: Hmm. If I may ask, where does fear starts from? Ite Ojeh: I’d say it comes from within and it is induced either by a previous experience or perceived notion. Ayodeji Oladeji Charles: If I may get you well, it starts from one’s mind right? 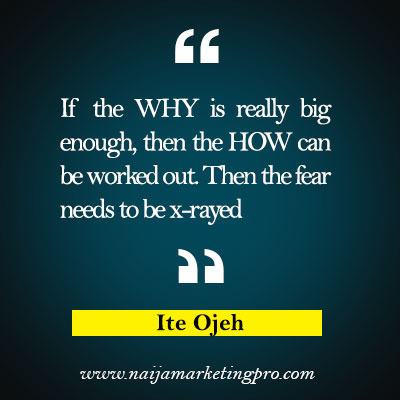 Ayodeji Oladeji Charles: But there can be fear of the unknown, now, networkers who are still in their business who haven’t taken action to overcome their fear of the unknown, how do you advise this kind of people? Ite Ojeh: Yes, there is fear of the unknown. That is induced by a perceived knowledge or notion. For such ones, they have to face those fears. The type of action to be taken depends on the type of fear. For example, if an MLM newbie holds back because of ‘fear of not knowing what to say’, the action will be to get trained, to improve his/her knowledge base especially on the business procedures and the products. Ayodeji Oladeji Charles: Hmmm. As a network marketer, were there any point in time that you experienced fear of rejection? Ite Ojeh: That’s just an example to show that every ‘fear’ can be addressed. Oh yes of course, there were days that I experienced it. Ayodeji Oladeji Charles: How were you able to surmount this fear of rejection? Ite Ojeh: I evaluated the ‘fear’, identified the cause and put in targeted efforts to overcome it. And I did overcome it! Ayodeji Oladeji Charles: How do one develop resistance against fear? 10. Practice practice practice. And in no distant time, the fear will have been managed. Ayodeji Oladeji Charles: Oh..Great. Why do people not have more success in their businesses as expected? Ite Ojeh: Okay. Every field of endeavor has its nitty gritty. 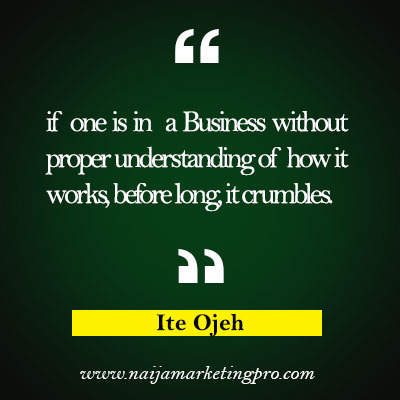 So if one is in a business without proper understanding of how it works, before long, it crumbles. There are basics that should be known, those are non-negotiable factors. Moreso in MLM where one can earn while learning, the basic knowledge has to be acquired. Ayodeji Oladeji Charles: Definitely, that’s true. What about focus in this wise? 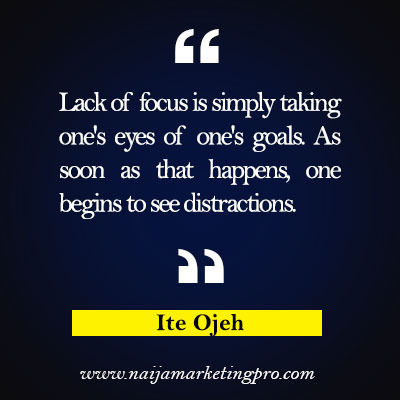 Ite Ojeh: Lack of focus is simply taking one’s eyes of one’s goals. As soon as that happens, one begins to see distractions. So focus is keeping one’s eyes on the REASON(S) which prompted involvement in the business in the first place. When one is focused, obstacles and challenges do not stop one from pursuing one’s goals. The focused person faces the challenges, makes the needed adjustment to achieve his/her goals. Ayodeji Oladeji Charles: Thanks for this nugget. I am learning. 90% of network marketers, according to reports usually fail in their first few years to this opportunity, what is the major cause for this? Ayodeji Oladeji Charles: Ponzi scheme, money spinners…smiles…Do you believe that challenges build character? Ite Ojeh: If properly harnessed, yes. Ayodeji Oladeji Charles: Then, tell us how. Ite Ojeh: Mr A & Mr B have similar circumstances, face the same challenge, but respond in two opposite reactions, that’s possible, right? Mr A decided to throw in the trowel after his one year business collapsed. Mr B on the other hand decided to go back to the drawing board, did an honest appraisal of the previous outing, took note of his errors and took the decision to correct them. Mr B has allowed his challenges to build a better him, a stronger character. So it’s about the way we respond/react to the challenges that come our way in the journey to financial freedom. Ayodeji Oladeji Charles: Wow. I am glad we met. 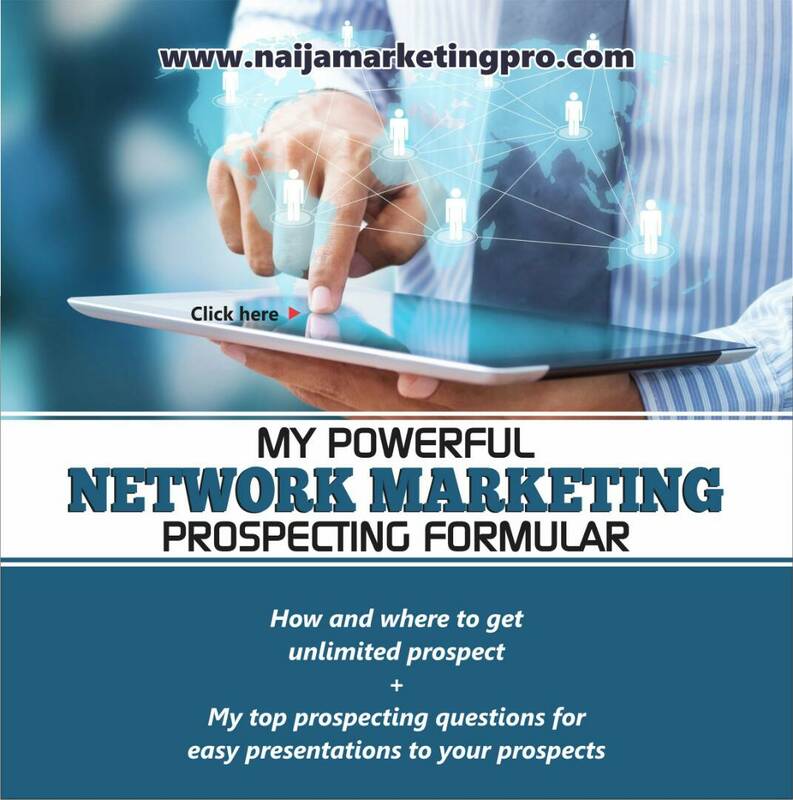 People that believed that they are not good at talking to prospects, and now, this fear keeps them from getting started in network marketing opportunity, what is your advice to them? Ite Ojeh: Well, first of all, the person needs to isolate WHY he wants to join an MLM business. Honestly, if the WHY is really big enough, then the HOW can be worked out. Then the fear needs to be x-rayed. Ayodeji Oladeji Charles: Thank you. 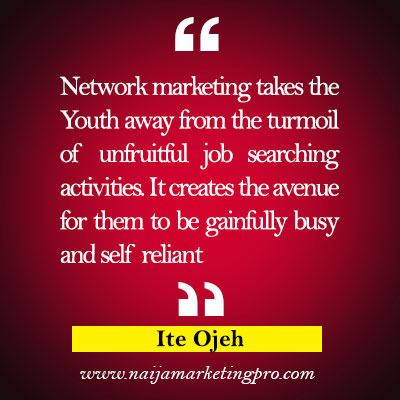 How do you think network marketing is the solution to youth unemployment in Nigeria? Ite Ojeh: Well, it takes the Youth away from the turmoil of unfruitful job searching activities. It creates the avenue for them to be gainfully busy and self reliant. Ayodeji Oladeji Charles: Definitely. What do you do after work? Ite Ojeh: I engage in Christian spiritual activities, take care of my family, read, listen to music and play. Ayodeji Oladeji Charles: What more can I say…. What encouragement/words do you have for Naija Marketing Pro Community? Ite Ojeh: Wow! 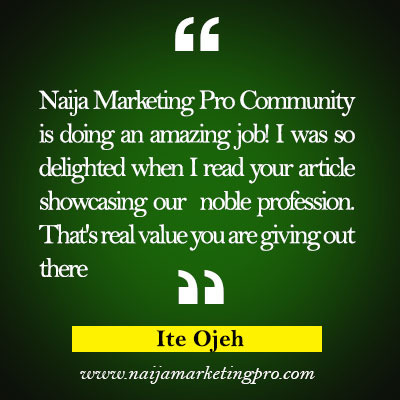 Naija Marketing Pro Community is doing an amazing job! I was so delighted when I read your article showcasing our noble profession. That’s real value you are giving out there. Well done, I wish you greater heights. May the Almighty bless you efforts! Ayodeji Oladeji Charles: Amen. We are also glad that you accepted our invitation to interview you on a beautiful day like this. It is my greatest hope that this will go a long way to help put confidence in the life of others that might have been worn out of life by fear. On this note, we have come to the end of the interview. « NO GIANT CALLED UNEMPLOYMENT BUT THERE IS A GIANT CALLED LAZINESS AND SELFISHNESS…. A really,really great,encouraging and educative content,naija marketing pro is changing lives God bless this community.